Some of the loveliest and most inspiring sounds on earth are made by animals. These wild voices are all around us, from the most remote forest to the heart of the city. Sometimes they're loud and clamoring, sometimes they're soft and delicate, but they bring a very special beauty into our lives. Think of the haunting cry of the common loon, the wolf's lonely howl, or the raucous clamoring of ravens. Why do these animals have voices? Just as humans express themselves through words and song, animals also make unique and impressive sounds to communicate. In the spring, the sweet, ringing notes of male songbirds proclaim their territory to other males and sing their invitations for romance to the females. Throughout the northern forests one of the most beautiful of all of these songs is performed by the hermit thrush. Each male's song is unique, and if you listen carefully, you can hear the hermit thrush repeat his song but in a different octave each time! A nearby thrush often replies—called "counter singing"—like a duel between two brilliant singers on neighboring territories. Birds also use their voices to sound the alarm when there's danger close by, such as a human, a hawk or another predator. Listen to the alarm call of the robin. 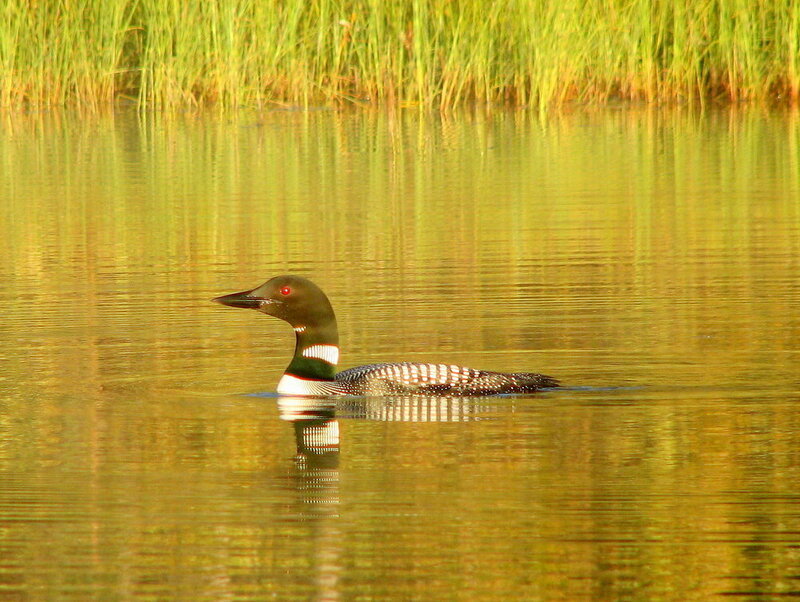 The common loon makes a simple wailing call to keep in touch with its mate, and an intense yodeling call to let all other loons know their territorial claim. Canada geese regularly call out from the skies as they pass overhead. This is a way for flocking birds to keep track of each other—for example, a male and female goose constantly "talk" back and forth during their long migration. Geese newly arrived at a pond or lake for the evening often honk to those flying over as if to say, "We're down here in a good place to rest and feed." Nestling birds, like human babies, are well equipped to make their needs known. In cities and towns, we often hear the insistent cheeps of little robins begging for food when their parents visit the nest. Listen to these young gray jays in northern Alaska, old enough to fly but still chasing their parents around, asking for food and exchanging chatters with the patient adults. Some birds have a simple song--just one or two notes--while others, like the winter wren may sing dozens or even hundreds of songs. The winter wren is an unassuming brown bird about the length of a human adult's thumb, yet it's songs are so complex and varied that ornithologist Donald Kroodsma describes them as "a blistering blur of whistles and trills, delivered at breakneck speed." Each individual bird may have a slightly different song from others of his same species. This means neighboring birds can easily identify each other by sound, just as we get to know people by their voices. Listen for the difference between these two Swainson's thrushes—one fairly short and simple, the other longer and more complex. Birds of the same species living in different areas can also have dialects that we can hear by paying close attention. Listen to a fox sparrow in southeast Alaska compared to a fox sparrow living in the Brooks Range in far northern Alaska. And here's the song of a Swainson's thrush from southeast Alaska to compare with a Swainson's thrush singing in the Brooks Range. As with birds, other animals also use their voices to stake their patch of land, to establish social dominance or claim mating rights, to warn of predators or other danger, to show aggression, or to locate members of the family. Here's a bull elk in a meadow in the Yukon Territory of Canada, making spectacular bugling calls to claim his dominance over other males. And this is a bellowing bull muskox during the fall mating season in arctic Alaska. On the northern mountains and tundra, the arctic ground squirrel whistles to warn other ground squirrels that there's danger approaching. Many animals make aggressive warning signals for others to stay away. Here's the dramatic growling of polar bears arguing over a whale carcass on the arctic coast of Alaska, and the roaring of Steller's sea lions, perhaps showing their unhappiness that a boat has come too close. Humpback whales* sing mostly in their mating areas around the Hawaiian Islands and other warm oceans of the world, but sometimes they sing along the Alaskan coast before migrating south. The beautiful and elaborate songs can last for up to twenty minutes. Researchers think they might be related to attracting mates or to competition between males, but they may also be a type of sonar to help locate other whales. We are lucky enough to be surrounded by natural voices like these. All we have to do is stop and listen for this free concert from our animal neighbors.